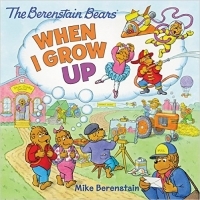 The Berenstain Bears celebrate Career Day in When I Grow Up, a brand new 8x8 storybook addition to the classic New York Times bestselling series. After an exciting presentation at school, Sister isn’t sure what she wants to be when she grows up. But then, a friend of the Berenstains, Professor Actual Factual, takes Sister and Brother Bear on a special Bear Country job tour. Whether firefighter or artist, farmer or astronaut, there is sure to be a career to capture Sister’s imagination! Thoroughly engaging and deftly educational—this delightful story of exploration doubles as a great conversation-starter between parents and children. It may even get kids considering their future career options with open-minded optimism. After a fascinating and visual career day at school, Brother and Sister Bear are whisked away by professor Actual Factual on a Bear Country Job Tour. Between driving and flying, they are given an overview of dozens of possible job choices and some of the activities they entail. From Bakers to Astronauts, Entertainers to Scientists, Artists to Firefighters—this book makes an effort to represent a broad spectrum of career paths, all with an equal air of value and respect. Even the job of “a mom or a dad” is presented toward the end, and their importance praised. The book remains true to the classic characters created by Stand and Jan Berenstain—the bright, iconic artwork consistent throughout. Coming in at 24 pages and filled with multi-paragraph dialogue and exposition, this glossy paperback is ideal for children ages 4 to 8.